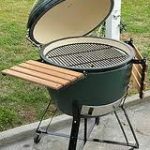 The Big Green Egg is an innovative ceramic grill. It is a charcoal grill that can be used as a smoker or oven as well. It has strong ceramic walls that are very good at keeping in heat and moisture. The Big Green Egg is convenient to use and lends delicious flavor to anything cooked in it. It is very durable and allows meat to be cooked in temperatures of up to 1200 degrees Fahrenheit. 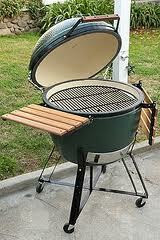 The Big Green Egg is widely known for its impressive versatility. It can grill, sear, bake, and smoke food through its direct and indirect configurations. Grilling with the Big Green Egg is very simple. First you need to choose the charcoal you’d like to cook with. Then you place the charcoal in the grill and light it. There are several easy methods for lighting, but using lighter fluid is discouraged. After the charcoal is ready to go, you place the Big Green Egg’s cooking grid on top of the fire ring. Now you can grill whatever you’d like. If you want to give your meat a strong sear, you can take the fire ring off and place the grid right on the fire box. This gives meat exposure to very high heat. In order to make use of the Big Green Egg’s indirect cooking configuration, you’ll need to purchase the plate setter accessory. The plate setter is a ceramic panel that can be placed on the fire ring in order to separate the fire box from the cooking space. This allows for slow cooking methods like smoking to be done. The plate setter is made so that the food does not have to be rotated and is cooked evenly from every side. To begin, place your charcoal in your Egg and light it. You don’t usually need as much charcoal when cooking indirectly. To configure your Big Green Egg for indirect cooking, place the plate setter with its legs facing up on top of the fire ring. Then place the grid on top of the legs. A drip tray can also be put on the plate setter under the grid to catch juices. With the plate setter shielding the food from direct heat, it instead cooks by radiant, indirect heat. This allows for slow cooking and that fall-off-the-bone tenderness. Brisket, ribs, and many other delicious foods can be cooked by the indirect configuration. The configuration for baking is almost identical to the smoking configuration, but differs in that a pizza stone or similar item is placed on top of the grid. This allows for authentic flavor to pizzas and breads similar to that of a pizza oven. The very high temperatures that the Big Green Egg can produce will give a delicious brick-oven taste to baked goods. Gas grills and conventional ovens don’t compare. The grid extender is a great accessory for the Big Green Egg. It has a few useful functions. The grid extender is placed on top of the cooking grid. It is mainly used as extra space to grill more food at once. It is usually used in the indirect configuration. The grid extender can also be used to warm food as well. For direct grilling, if you would like the temperature to be a little softer for vegetable grilling or the like, you can use the grid extender to move the food away from the heat a little. Whether you’re in the mood for brick-oven style pizza, want to give a steak a delicious sear, or whether you’re ready for a long, slow cooking session, the Big Green Egg can fulfill all your grilling needs. With high quality ceramic and the ability to produce extremely high levels of heat, this grill can impart some real flavor. The Big Green Egg’s multipurpose accessories and configurations make several grilling methods easy and accessible.